When I listen to music, it tends to happen in one of two ways. Actually, that’s not really completely accurate — it starts with me having everything on shuffle, then a great song comes on that I haven’t heard in a while and I hit the repeat button. Then I listen to nothing but that song for a week straight. We have been working on Markus Zusak’s The Book Thief and just completed a section that really hit home with a lot of students – and me as well. Rudy has been down on his luck and needs nothing more than a win. No matter how many times I read this book, this part really gets me every time. I mean, we’ve all been there, right? So Rudy has been in my train of thought and then last night as I was driving, a song came on that just seemed to fit my vision of him at this point of the story. I got to thinking that we could probably tie a lot of characters that we study into songs – that sometimes, by taking a look at both our understanding of the characters and our understanding or a feel for a song – we can really take both to a deeper level. And that’s what spawned this project. I go back and forth with Liesel – I love her at times and just want to shake some sense into her at others. Having said that, I can completely associate with her sense of abandonment, her desire to please, and just her sense of bewilderment at times. I can’t help but think of her first appearing at the Hubermann’s house, refusing to get out of the car for Rosa – she’s just horribly frightened of this new arrangement and feels abandoned by her mother. It’s also at this point that we see the bonding between Liesel and Hans begin: “Outside, through the circle she’d made, Liesel could see the tall man’s fingers, still holding the cigarette. Ash stumbled from its edge and lunged and lifted several times until it hit the ground. It took nearly fifteen minutes to coax her from the car. It was the tall man who did it. Quietly” (Zusak 28). This happened after Rosa had just got done asking what was wrong with this child. At the same time, I just see her as being really, really innocent. It’s for these reasons that I chose Scala & Kolacny’s cover of Radiohead’s “Creep” to represent Liesel and her confusion. There’s something haunting about this version, yet the lyrics still act as a punch to the gut. I feel as though they get to all of the issues I’ve spoken about above – as long as there have been children and teenagers, there have been children who are lost in the process of finding themselves. couldn’t look you in the eye. your skin makes me cry. One of the things that I like the most about this choice for Liesel is that, to me, both the music and the lyrics fit her so well. While the music seems to be operatic and beautiful, the words themselves that they are singing are biting. This is how I see Liesel – carefree and full of wonderment at times, yet harsh and bitter at others. It’s for these reasons that I’m really able to see Liesel as I hear this one. This was actually the first song that came to mind, and, well, the song that sparked this idea, I should say. Rudy loves Liesel – in the narrator’s words “He loved her so incredibly hard” (Zusak 303). And we see him go up and down with this love. At times he knows when to push things, while at others he realizes when he needs to back off. 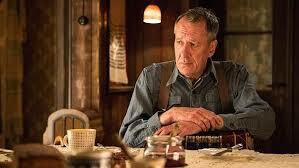 At times, he’s that sounding board, that listener whom Liesel so desperately needs in her life. 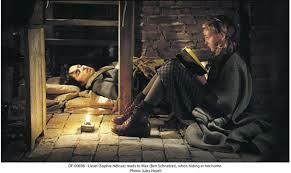 But he can’t help but to develop feelings for Liesel, and this sets himself up for these ups and downs in general. I know how strange it can seem to someone who hasn’t read the book, but Death is just an awesome character, an awesome narrator. It’s actually a little weird to even type that sentence! 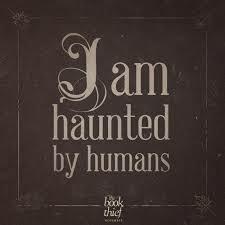 In this book, though, Zusak is quick to remind us that “Even death has a heart” (242). From the start, when we’re told that Death is searching for reasons to understand why humans are worth it, we’re taken on a journey of redemption. We see things through the eyes of a sympathetic, yet complicated, character. Instead of Death being this negative presence, however, I come to see him as being just kind of there, overseeing everything – questioning everything, wondering, worrying, thinking. In a sense, I see him floating above everything in a very ethereal way. Because of this, I also see Death being tied into another LaMontagne song called “Empty.” The song has a lilting quality about it – the instruments just seem to hang in the background a little and his voice doesn’t overpower anything at the same time. There are particular lyrics within this song that hit me pretty hard, though. At 4:07, LaMontagne sings “Well I looked my demons in the eye, laid bare my chest, said do your best to destroy me. You see I’ve been to hell and back so many times, I must admit you kind of bore me.” Now, it might seem weird that I’m applying this to Death, when in reality, LaMontagne is calling death out. But in a roundabout way, this is what Zusak’s Death is going through. He tells us that “(He’s) seen more eclipses than he cares to remember” (Zusak 11). It makes perfect sense to me that Death needs to hear LaMontagne’s words — that he just might be comforted by them. Hans is just this awesome, Atticus Finch-like character. He has all of the right answers, he knows everything to say and when to say it, and he just gets Liesel to adore him in such a natural way. Like Atticus, I think he’s this heroic father-figure whom everyone wants as a father and every father wants to be. At the same time, he’s very complex. Take a stand against the Nazis during World War II, putting your life and your family’s in imminent danger because you refuse to join the Nazi Party? Check. Take it one step further by hiding a Jew in your basement? Check. Take a stand against everything being shoved down your throat – by actually acting as a human should – by offering a hungry person (who just so happens to be a Jew) food? You’re darn right he’s going to do this. Perhaps the line that hit me the hardest concerning Hans wasn’t even something that he, himself, said, but rather was thought by Liesel some time later. Earlier in the novel, he had excused Max for turning his back on his own father when he was a youngster, passing this behavior off because he was so young. 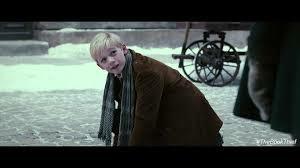 Now it was Liesel’s turn to justify her father’s behavior; after Hans came to realize he had jeopardized his family even more, he was beating himself up, calling himself “‘an idiot. '” While it took over a year for the words to come to her, Liesel realized that this wasn’t the case all along when she said “No, Papa. You’re just a man” (Zusak 402). I remember the first time that I read this book and talking to our Librarian, Mrs. Carrie Vottero, about how much I HATED Rosa. I’m not even sure that that word is strong enough for how I felt about her. My immediate thoughts about her actually take me to a song like “One” by Metallica – something that’s just dark and gloomy and miserable. But Mrs. Vottero told me about how much she LOVED Rosa. I was just shocked. How could anyone think this was even debatable? Rosa was just insanely horrendous and I would not change my feelings on her. And then I read further. And I saw some slight changes happening. And I started to see a glimpse of an actual human being. And then I started to (gasp!) come around on her. Dang, I had to admit to Mrs. Vottero that she was right! I watched as Rosa seemingly changed into a human being. I watched her show that she cared, and in turn, I started to care for her as well. 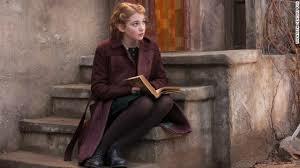 Whereas at the beginning of the novel I felt it was all about her and that she was annoyed with Liesel, I now feel that she’s got a big heart and have to commend her for even taking on Liesel in a very difficult situation. By no means did the Hubermanns have to take in the daughter of a communist during this time period, let alone hiding a Jew in her basement. Rosa, truly, demonstrated that she was a wildcard, for sure, but also a “good woman for a crisis” (Zusak 211). I saw Rosa become vulnerable – and that’s something that I truly love about a person and a character. I have to admit that I had some difficulty finding a song that fit Rosa. Nothing was coming to me immediately, and then I realized that maybe this paralleled my love/hate relationship with her as a character. Hmmm, makes sense to me. So I started to think about songs in my own iTunes library that I’ve turned to when I’ve needed comforting; songs that don’t necessarily bring me out of a funk, but make me realize that I’m not the only one in that funk. And then it hit me. Lone Justice’s “Shelter” is a song that I’ve leaned on many, many times. Again, here’s this woman who has taken on a child in an extremely difficult situation, comes on strong, yet becomes a mother to her in the process. I can almost hear Rosa singing this song to Liesel, especially after Hans has left. It’s almost like a lullaby; a reassurance that things are going to be fine. (Of course, the only way that Rosa could sing this song would be if it contained words like saukerl or saumensch or scheisse). For some reason, I can just see Rosa singing “Disillusion has an edge so sharp, it tears at your soul and leaves a stain upon your heart,” (1:35) – and I’m not so sure whether she would be singing it to Liesel or to herself. I tend to go back and forth on Max, depending on what’s going on in my own life at the time. We joke about being on #teamrudy or #teammax, and there have certainly times, even during a particular reading alone, that I lean toward Max (for the record, I tend to lean more toward Rudy, however). For this most recent reading, I really liked the scenes with Rudy concerning his fighting. 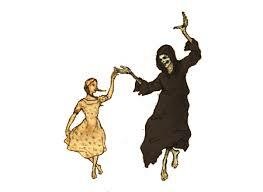 I liked the idea of him telling us that “‘When death captures me…he will feel my fist on his face” (Zusak 189). Further hearing the stories we are told about Max and Walter intrigues me even more. I like that Max is a fighter – and he absolutely needed to be one as a Jew during this time period. Because of these reasons, I see something fast, something in your face, musically, to represent Max. I really bought in to him as a fighter and entering that ring to face off with Hitler. So I see him needing an entrance song that sets things off, something like Drowning Pool’s “Bodies.” While this isn’t typically my preferred type of music, I do think it’s fitting. I like the repetition of “Nothing’s wrong with me,” and “Something’s got to give” – I think it parallels Max being in the basement. He’s a Jew being hidden by Germans. At some point, something is just going to have to happen. But I also like the lyrics in what might be the only actual verse of the song (2:07): “Skin against skin, blood and bone, You’re all by yourself but you’re not alone – You wanted in now you’re here, Driven by hate, consumed by fear.” I read those lyrics with Max in mind and feel as though they’re just so fitting. I just see a lot of power in both Max and the song itself. Max needed it to keep him going, to keep the fight alive, and I believe this is a great song to set that all off. I think that it can be seen, in a piece as visual as Markus Zusak’s The Book Thief, that ties to specific songs can be made. In my opinion, each of these characters has a definitive feeling that goes along with Zusak’s portrayal and it is possible to provide a deeper analysis of each of the characters through different songs and their lyrics themselves. Making these ties provided me with a deeper understanding of not only the book, but they also enabled me to further examine the characters while listening to these songs.